I know I’m giving you the run over on the mug cakes this week but I figured you’d want to get this made ASAP because it’s just too good to not make! This stuff was handed down from the heavens as far as I’m concerned, and I won’t judge if you end up stocking this up on trays in your fridge. The only qualm I have with this stuff is that the chocolate melts pretty quick because it’s mostly made up of fat…but who the heck cares? Are you going to be holding this stuff for more than 10 seconds? If so, then something’s probably wrong with you. As soon as I start eating it, it disappears and I just can’t figure it out. It melts in your mouth to an absolute degree of deliciousness. The salty aspect of the bacon, the textural contrasts between the soft fatty bits of the bacon and the chewy meaty parts, the different flavors that come through – really, you need to give this one a try. 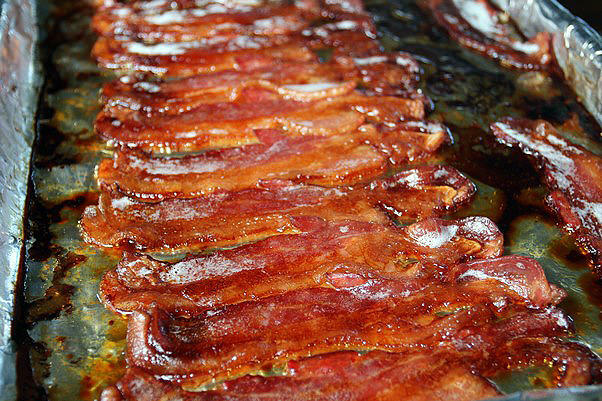 The candying of the bacon really brings hints of sweet out each and every bite you get of the fat. A perfect pairing from the salty undertones and natural earthiness of the pecans. 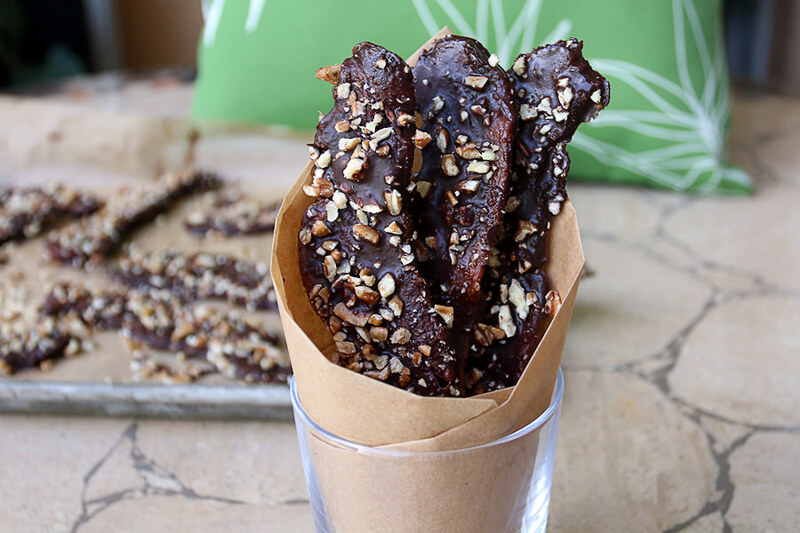 As you get into the meat of the bacon, the chewy texture makes you work for your food, but work is something I’m definitely willing to do for these treats. Do yourself a favor and don’t miss out on these! Let me know whatcha think when you make them – dying to hear peoples thoughts! 1. 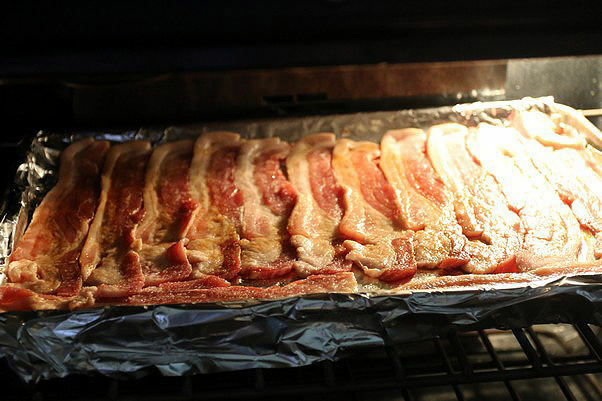 Preheat oven to 400F, then lay 13 slices of bacon onto a baking sheet lined with foil. 2. Sprinkle 1 Tbsp. NOW Erythritol and 1 1/2 tsp. Maple Extract over one side of the bacon and rub it in. 3. Flip bacon onto the other side and do the same thing. Rub everything in well. 4. 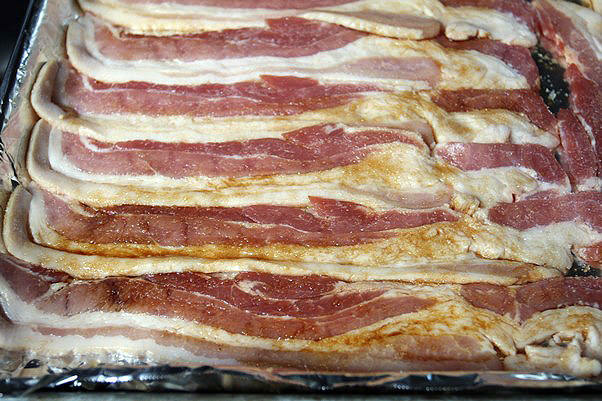 Bake the bacon for 40-50 minutes until crisp. 5. 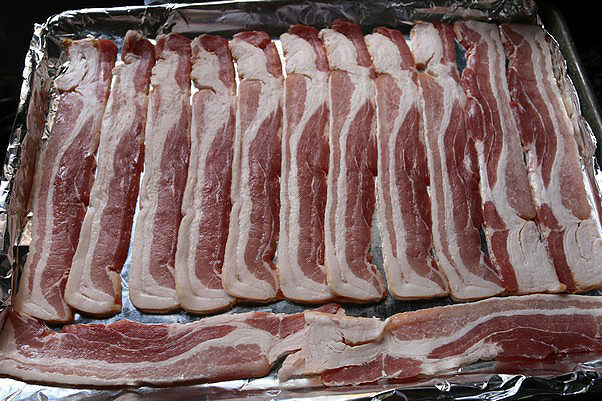 Once the bacon is finished, set aside for 5 minutes to allow it to cool for a moment. 6. 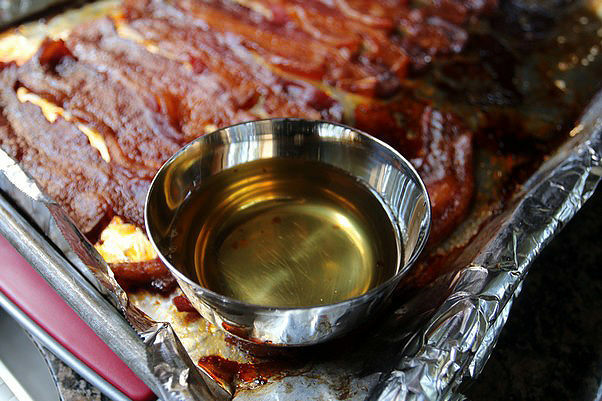 In a container, render bacon fat by tipping cooking sheet at an angle. This should get you about 5 Tbsp. Bacon Fat. 7. Add 4 Tbsp. Cocoa Powder, 2 Tbsp. NOW Erythritol, and 15 Drop Liquid Stevia to the bacon grease and mix well. 8. 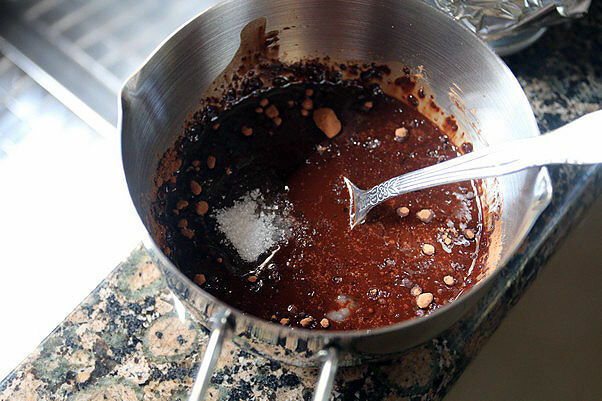 Transfer the chocolate mixture to a different container so that you can dip the bacon inside. 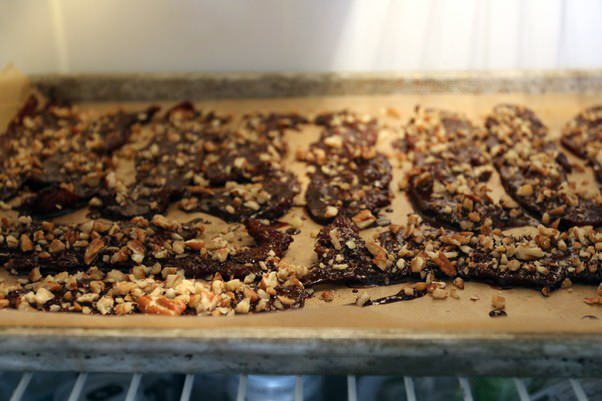 Submerge all the bacon into the chocolate and transfer to a sheet of parchment paper. Sprinkle 1/4 Cup Chopped Pecans over the bacon before chocolate dries. 9. 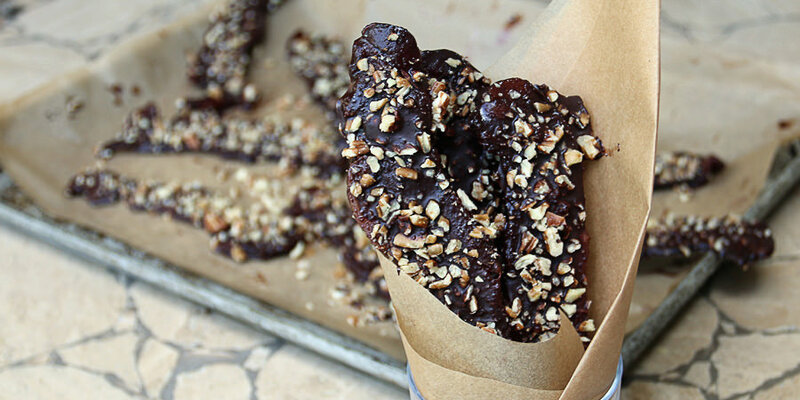 Put the chocolate covered bacon into the refrigerator for at least 5 hours. Preferably overnight. Makes 13 slices of Chocolate Covered Maple Pecan Bacon. Each slice is 74.92 Calories, 5.77g Fats, 0.76g Net Carbs, and 4.42g Protein. 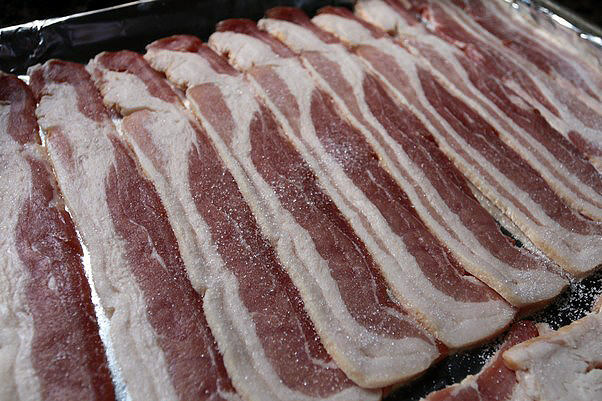 Lay bacon out on a foil lined baking sheet. Sprinkle erythritol and maple extract over both sides of the bacon. Rub erythritol and maple extract into the bacon. Bake for 40-50 minutes until browned and crisp. While hot, render all bacon grease into a separate container. Add Cocoa Powder, Erythritol, and Stevia to bacon grease and mix well. Pour this into a larger container if needed. 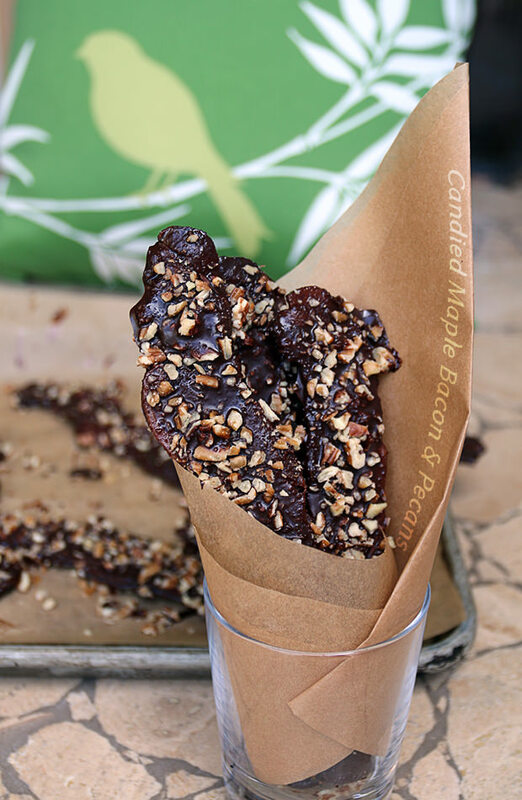 Dip now cooled bacon into chocolate sauce and lay onto parchment paper. 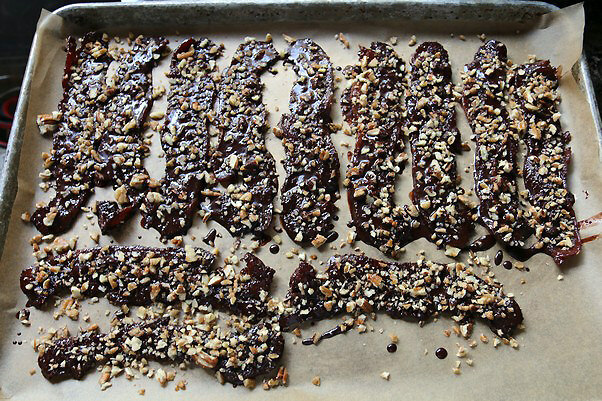 Sprinkle chopped pecans over bacon before chocolate cools.